After you have created your villager, one of the first things you can do is choosing its career. 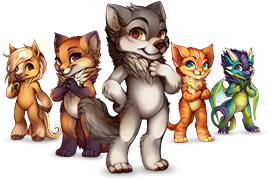 Careers are very important in the world of Furvilla, they provide you with a wide variety of items you can use in a lot of different ways. Each career has a career type, also known as career level. These types are a way of determining how hard the career is and how much the career relies on other careers. The higher the level of your career, the more it relies on other careers to provide them with the needed items. Newbie - It is highly recommended for new players to start out with this career, as this career does not rely on other careers. Basic (Level 1) - Basic careers need no other careers to start out, but will need one other career to be able to excel in them. Intermediate (Level 2) - Intermediate careers provide the items that are needed for artisan careers to produce their final products. Artisan (Level 3) - Artisan careers almost completely rely on other careers to provide them with the items they need for their products. As you might already have noticed, it is wise to start out with a newbie career and slowly work your way up to the basic career, then the intermediate career and after that the artisan career. Your villager's career can be changed once every two hours. 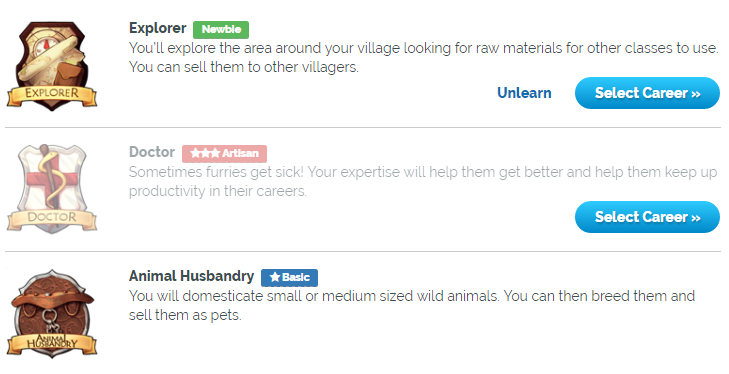 To change your villager’s career you need to go to their career page and click on the top right button that says ‘change career’. This button will bring you to a new page, displaying all available careers. You will have to click on the Select career button to select the career you wish for your villager to occupy. If there is no 'select career' button next to a career, your villager is already in that career! All careers that are not faded out are careers your villager already has some experience in. Please note that when changing your career you won’t lose any experience, skill or items the villager had in their previous career, you will be able to change back to their old career and just continue where you left off! A villager can only switch careers if they are not busy. This means your villager can't switch careers when they are for example crafting an item: you will only be able to switch careers once the villager has finished their current task. A villager can only learn up to four careers. If you wish to start a new career but have already hit the maximum of four careers, you are able to unlearn a career. Keep in mind that you will lose all experience your villager has in the career you are unlearning: this action can't be undone! The above chart shows you more about the influences each career has on other careers. We will be breaking down every career into different sections so you have easy access to what each career provides to other careers and what they need to do so. The Explorer Career is a newbie career. As an explorer your villager can collect items special to their village, varying from seeds to wood to raw materials and even some FurCash! The explorer career relies on no other career and it is therefore highly recommended to start out with an explorer. All careers rely on the explorer career, some more directly than others. There are five careers that currently directly rely on the explorer. - Crafters and Tailors with raw materials and rare items. Animal Husbandry is a basic career, it doesn't need a lot from other careers just to start out, but will need help from one other career for you to excel in it. No other careers rely on Animal Husbandry, it is purely meant for collecting animals, who you can then either add to your menagerie as a 'collection' or add to one of your villagers and play with them for FurCash. No other careers rely on the Animal Husbandry career. This career is meant for collecting animals. You can however add these animals to your menagerie as some sort of collection or add them to one of your villagers to play with them for a small amount of FurCash. If you want to add more pets to your animal husbandry, you will need a Construction Worker to provide you with stables. The Warrior career is a basic career. As a warrior your villager has the task to protect its village, a warrior therefore needs weapons and armor to be able to defend themselves. Warriors need weapons and armor, you can get those from a Blacksmith. The Herbalist career is an intermediate career, it provides the artisan careers with the final items they need to craft their products. The Herbalist needs seeds from Explorers. Each village has eight unique seeds, with varying rarities from common to super rare. The Construction Worker career is an intermediate career, it relies on at least one career and provides other careers with houses, stables and pots. The Construction Worker relies on Explorers and Warriors to find slabs. Each village has their own specific type of slab, but each slab type can be used for building purposes, no matter what village you live in. The Crafter career is an intermediate career, crafters are able to produce special items the tailor career can use for making a costume. Crafters rely on Explorers to find them rare items and Warriors to find them tokens or coins. Before they can start crafting items, they will need to buy blueprints and sewing sets in their village's craft shop. You can only buy village-specific blueprints and sewing sets in this shop, if you however wish to buy the blueprints and sewing sets from other villages, you will need to buy them from another user. The Doctor career is an artisan career, it fully relies on other careers and provides your villagers or other users villagers with medicines. Doctors rely on Herbalists to harvest plants for them. Before they can start crafting medicines, they will need to buy recipes and containers in their village's clinic. You can only buy village-specific recipes and containers in this shop, if you however wish to buy the recipes and containers from other villages, you will need to buy them from another user. - Villagers with medicines to cure them from their diseases. 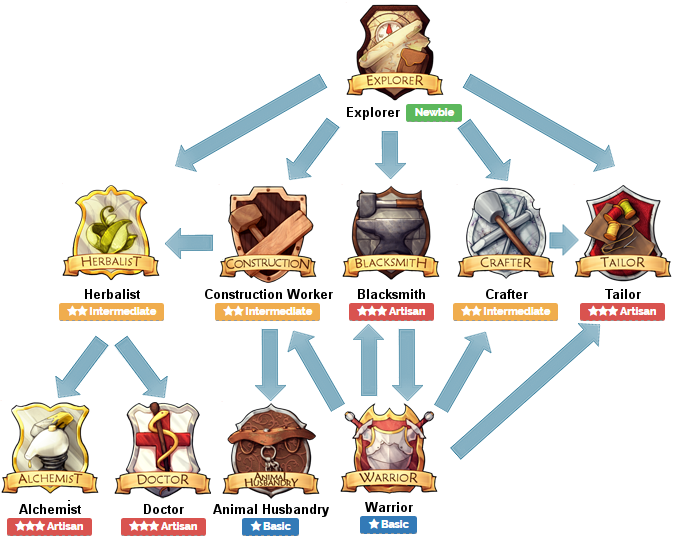 The Alchemist career is an artisan career, it fully relies on other careers and provides your villagers with potions they can use to either help them with their careers or to change their appearance. Alchemists rely on Herbalists to harvest plants for them. Before they can start crafting potions, they will need to buy potion recipes in their village's potion shop. You can only buy village-specific potion recipes in this shop, if you however wish to buy the potion recipes from other villages, you will need to buy them from another user. The Blacksmith career is an artisan career, and relies on other careers to provide it with the needed items to craft weapons. Before they can start crafting weapons, they will need to buy schemas and reagents in their village's weapon shop. You can only buy village-specific schemas and reagents in this shop, if you however wish to buy the schemas and reagents from other villages, you will need to buy them from another user. The Tailor career is an artisan career. Tailors fully rely on other careers to craft them the items needed to create a costume. Tailors rely on Crafters to craft them rare items they need for their costumes and Warriors to provide them with loot. Before they can start crafting costumes, they will need to buy pattern books in their village's costume shop. You can only buy village-specific pattern books in this shop, if you however wish to buy the pattern books from other villages, you will need to buy them from another user.